Now do you want one? Toyota wants the return of the ‘Three Brothers’ ASAP, so despite declining sales we fully expect a new generation of the Toyota 86 to arrive around the same time as the reborn Supra and spiritual successor to the MR2. In the meantime, the Japanese carmaker has introduced the Toyota 86 Special Edition. Limited to 860 units finished in Halo White and another 860 coated in Supernova Orange (pictured), the new trim gets a pair of black racing stripes down the middle, black side mirrors, a black rear spoiler and 17-inch rims finished in black chrome. A black leather interior comes with orange contrast stitching on the seats, steering wheel, door panels, dash and handbrake. Like the Subaru BRZ Limited, it also gets a push-button start, dual-zone automatic climate control, heated seats and a new 4.2-inch TFT screen in the instrument cluster where g-meter and lap-timer functions, as well as engine vitals and power curves can be viewed. The 2.0-liter naturally-aspirated four-cylinder engine continues to deliver 205 horsepower (manual) and 200 hp (auto). 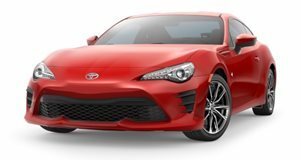 Sales for the Toyota 86 860 begin later this month, priced at $30,040 for the six-speed manual and $30,760 for the automatic.